So...? with Attitude have been keeping girls smelling fab since the 90's. The brand is now multi-award winners and present in more than 30 countries over 5 different continents. It all begun back in 1994 with the release of So...? 2001 brought with it So...? Kiss Me which instantly became a favourite and is still their best selling scent to date. The range of yummy So...? fragrances broadened even further with the launch of So...? Sinful and its hypnotic mix of notes in 2005. In 2012 they took on hair care by creating a Dry Shampoo range consisting of 4 gorgeous scented shampoo's. Now in 2015 the So...? range is still growing, and even after 20 years in the game they are still committed to providing their So...? girls (new and old) with unique, quality fragrances at purse-friendly prices. If fragrance is as much your addiction as fashion, you’ll love the fun, feminine and flirtatious scents from So...? that brings the two together in one beautiful bottle. A cult beauty favourite, So...? takes its cues from the latest catwalk trends, mixing them with street chic and divine femininity; the So...? 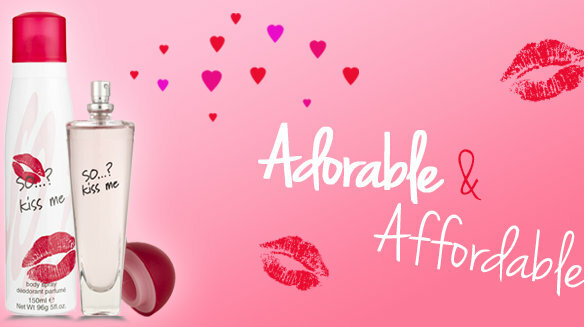 collection has a classic, desirable and ultra- feminine fragrance to suit every girl’s attitude. For a super indulgent scented experience, apply the Body Fragrance with a quick spritz of the Eau de Toilette to ensure that the So...? scent stays with you for longer. Our new brand was introduced in 1994, only a year after Jean Paul Gaultier's Classique. They do have quite a few notes in common and their dominant accords are similar. However, our brand is much simpler and although it's not a smell-alike, I feel it has a similar vibe. A must-have for every young woman! Delicious, feminine, seductive and rich, there is something for every young lady in this line. I’ll be saving this little gem for those evenings when I’m craving a little bit of adventure. Definitely worth a try!